I have done these many times they taste amazing!! This looks really good, I never thought of trying that before but I definitely will! This looks amazing, also great for low carb diets. Great idea! Looks great and so much healthier than traditional pizza. That, and an Amstel Light. Now you're talkin! for those that hate mushrooms, mix up spinach & egg whites & bake. top with sauce and return to oven until hot and bubbly. awesome! OOHHH!!! My favorite pizza is spinach and mushroom, and since I'm allergic to gluten, dairy, corn and tomatoes, the only pizza I can eat is about $5 for 2 pizza crust and I never put tomato sauce on my pizza. I will definitely have to try this one! Sounds yummy! these look awesome! can't wait to try them! Oh, Tea-bag! Thanks for the idea about spinach and egg whites (or Egg Beaters, for that matter) as an alternative to the mushrooms! I am a hater of the 'shroom, and was really disappointed that I couldn't have a pizza make-over too! Thanks! I had this last night. Didn't put tomatoes on it but melted WW pepperjack cheese. Very tastee. This is a super recipe. I'll bet you could also do this with the smaller mushrooms as bite-sized party food and they would be delicious! I love making pizzas like this especially to pack for my lunch at work. I either use mushrooms or lavash bread that is 1 PPV. I bet you can use sliced eggplant or polenta too if you aren't a mushroom eater. I've got a mess of them! You can use mushroom caps and put spinach and cheese as a topping, you can use black beans, chicken and green chilies as toppings, you can do just about anything with this recipe. I've been gluten, dairy, corn and tomato free for years now and have tons of secrets! You can contact me through my website for some tips. Tea bag....can you go into more detail for the non-mushroom lovers!? This is an awesome idea! Love it and yes, so many things can be put into the mushroom! 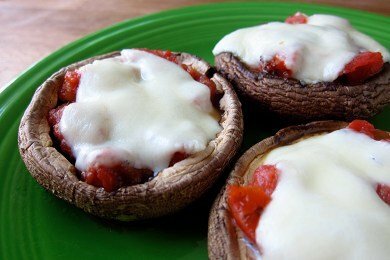 I loved stuffed mushrooms but never thought to make it "pizza like". Thanks so much! Snack Girl: Do you leave the gills in? PS I think that the Trader Joe's sundried tomatoes (the dry kind not in oil) would make a great addition and not add to the moisture. I love this idea! I need to worry about sodium, and the portabello takes care of that part for me. I make my own sauce with low-sodium tomatoes and tomato paste. Real (as opposed to artificial, I guess) mozzarella has a little less sodium...just have to measure out a limited amount...and it's guilt free pizza for lunch. Thank you! Hey a half a pound of melted cheese is good!! :) how about if it just didnt have calories.. This recipe looks excellent. I just made this it was amazing!!! !i added some spinach and artichoke hearts YUMMMYY!!! What a wonderful idea for healthy low calorie gluten free pizza. I often make healthy low calorie pizza at home by using tortillas for the crust - but look forward to trying this very soon. Got excited until I saw it was made with mushrooms. I just can't handle that. Shoot! HI, first time to your site. I like what i see! I LOVE Portobello mushrooms!!!!!!!! what a great recipe! I will be trying this one. Thanks, I have tried several different pizza crust recipes. one made w/ rice,another w/ cheese & eggs,another w/ almond&coconut flour, and w/ cauliflower. but this one w/ the portobellos sounds like a winner and less work. now if it just passes the family test!? This is such a great idea!. So great for those trying to be low carb and gluten free. thanks for all your super recipes! Wow! This is a super idea! I am definitely going to try these pizzas asap! So glad to have found your site! Thanks for the ideas!! made these for dinner tonight, SO delicious and much more satisfying than pizza with crust! I added a little bit of oregano on the top and that made them super yummy! I used regular sliced mushrooms in place of portobello mushroom caps. I didn't have any portobellos and the sliced mushrooms are much cheaper. I sprayed a cookie sheet, spread the mushrooms on the bottom of the pan for my make-shift crust, drained the fire roasted tomatoes, and sprinkled them with mozzarella cheese. I added a little bit of diced leftover chicken fajita meat. It was divine. It is a good fix for a pizza craving! Love it! Thanks for the photo teaser of these mushrooms at the bottom of today's post (Aug. 14, 2012)! Being relatively new to the website, I've missed a lot of what came before, even though I do a fair bit of exploring. These look like just the ticket for dinner tonight - just happen to have some mushrooms that need using, fresh tomatoes and fresh mozzarella as well. Thanks! Looks really tasty and am definatly going to try this, but not sure if it would help that "pizza craving" I find when I'm craving its the bread that forfills it. You will want to lightly scrape out the fan. Also, I baked at 425 degrees, 10 minutes cap side down, then turned mushroom over, sprinkle with sea salt, return to oven for 10 minutes more. After, 20 minutes of baking I filled the cap with sun dried toatoes, and parm/mozzarela mixed cheese. Delicious, and fully cooked not soggy! Yummy! I'm going to try this. My favorite Friday-night dinner is veggie pizza on a tortilla shell, whatever kind you prefer works. Bake the tortilla for about 5 minutes (called par-baking) before you put the toppings on if you like the crust to be crispy.